As promised, the recorded talks were uploaded to our YouTube channel, and are also listed here, for your convenience. Enjoy! Come and learn how to get started with RxSwift and MVVM. What is really an architecture, and what MVVM aims to solve over the standard usage of MVC? Why is RxSwift such a wonderful companion for employing MVVM? This presentation also includes actual live coding for building a basic MVVM-based login screen. Custom UI Animations — it’s not as hard as it looks! This presentation demonstrates various approaches toward animations in iOS, and shows you how a simple and mundane user interface can be easily turned into a rich interactive experience using classic UIKit APIs. 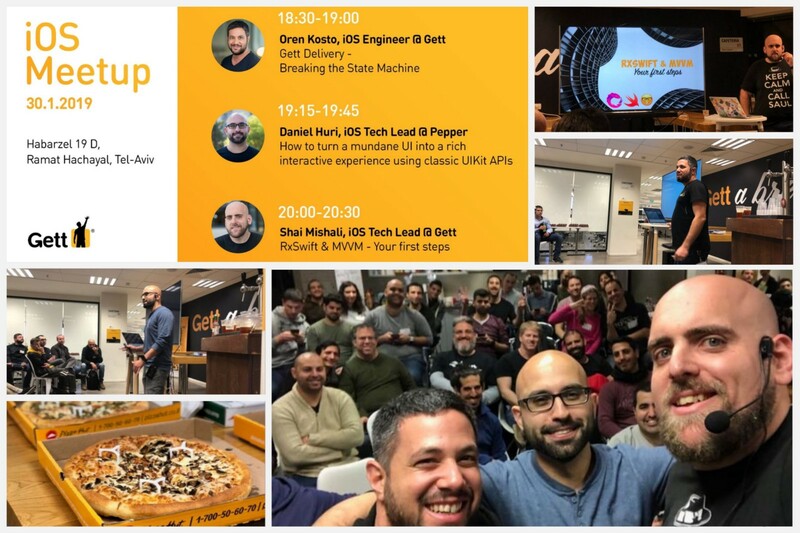 Learn How Gett Delivery leveraged Firebase and RxSwift to break its state machine, creating an architecture suited for the delivery world. As long as you’re here, why not check out our latest blog posts?